(a) Information Resources Department: acquires processes and manages the collections held by the library. The negotiation of terms from vendors and the management of the collection budget is also included in this portfolio. (b) Infrastructure Department: is responsible for library facilities, including opening hours, circulation, library IT, Human Resources, and finance, and is headed up by the Deputy University Librarian. (c) Information Services Department (ISD): has the responsibility for the delivery of professional services to the University community. This includes service development and delivery, relationships with the academy and the university-wide community. In short ISD is responsible for the development and delivery of services that allow library users (called ‘customers’ in this study) to reach their academic goals. For the purpose of the present study the main focus is given to the ISD. Service Innovation Unit: keeps abreast of international best practice and developments in technology to ensure that the library services are efficient and appropriate. It is responsible for the definition of services, the development and management of measures in order to enable the ‘library’ to determine what services are being used and what outcomes are being achieved through their use. In addition, the Unit receives feedback from the customers, including various university communities, according to which, services may be modified or upgraded as required. This feedback comes from a variety of areas but primarily through the Outreach Team and Faculty meetings as shown in Figure 1 below. Service Development Unit: for development and maintenance of all new services such as ELISE (Enabling Library & Information Skills for Everyone), online tutorials, subject guides etc. It receives service definitions from the Services Innovation Unit (above), and based on this input, existing services are modified or new ones are created. In addition, this unit manages the library’s online presence, and creates standardized templates for service delivery. Academic Services Unit: for building relationships with faculty, and identifying, promoting and delivering services. This Unit informs the academic community of the available services, and delivers required services to the community. Through either discussion with the community (Outreach Team) or the delivery of the services (Services Team) feedback from the customer is generated which in turn, is fed back to the Service Innovation Unit for consideration. Each faculty within the university has been assigned specialist contact librarians who are available to provide information, organize service delivery, give seminars, listen to concerns, facilitate feedback and work through any issues that may exist within a faculty in relation to the library. Figure 1 demonstrates a knowledge-flow perspective for the ISD. There is a vast amount of knowledge relating to the Library’s customers. Library management is now exploring more effective methods for organizing this knowledge. It is being captured to facilitate knowledge management activities such as evaluating, sharing, and storing of the customer knowledge within the ‘library’. The ‘Library’ expects that knowledge management activities will build a greater understanding of customers and their requirements and as these requirements will hopefully lead to the delivery of more appropriate and timely services. For this to occur it is imperative that the knowledge is organized appropriately. Knowledge from customers is the customer’s perceptions, insights and reactions, knowledge about other products, suppliers, markets and their environment, and comments about existing services. This category of customer knowledge will facilitate continuous improvement, e.g. through service improvements or new product developments. It provides a view of how the customer perceives their environment and their particular role within that environment. This provides the Library with a context in which to create and deliver services. The knowledge about customers and knowledge from customers are combined and then transformed into the ‘knowledge for customers’. Knowledge for customers is required for satisfying customers’ knowledge needs. This category focuses on the knowledge that the library provides to its customers in the form of final services, making it relevant to the individual context for each academic. It can also be an interim knowledge that can be used by customers for performing other tasks. It is contextual and therefore differs from library to library, and academic to academic. Although all service based enterprises, including libraries, provide various services to their customers, an essential and logical relationship between different kinds of customers’ knowledge is usually missing (Tian-Xue Feng & Jin-Xin Tian 2005). The present study asserts that knowledge for customer is a product of an integration and transformation of the previous two categories of customer knowledge as shown in Figure 2 and discussed in the next section. Step 1: The ‘tacit’ component of the librarian’s knowledge that was initially developed as a result of interfaces with their customers is evaluated by (i) the existing body of knowledge on the field, and (ii) by sharing and refining this ‘tacit’ component of ‘knowledge from customer’ with other librarians with similar experiences. The result will constitute refined knowledge from customer. Step 2: Both of the categories of knowledge from and knowledge about customers are shared and disseminated with all the librarians; in our case study, these are all the librarians within the ISD. Step 3: As a result of step 2 new tacit knowledge will be created that is necessary for understanding customers’ information needs and interests. This understanding, which is called ‘knowledge acquisition and application’, helps, among other things, the creation of innovative ideas for the library. These new ideas can then be used for designing new services for the customers, which are related to the third category of customer knowledge, that is, ‘knowledge for customer’. In addition to the adoption of the Gebert et al (2003) taxonomy of customer knowledge, the current study also makes a clear distinction between the ‘tacit’ and ‘explicit’ knowledge for all three categories of customer knowledge in order to facilitate effective management of this knowledge in academic libraries. The current state of technology for supporting knowledge management systems suggests that completely different types of component technologies and methods are required for the management of tacit and explicit knowledge. Therefore, addition of the tacit/explicit dimension to the Gebert et al (2003) taxonomy will facilitate development of automated methods for storage, access and interpretation of customer knowledge. This extended taxonomy constitutes the theoretical contribution of this study. from the available data. The following qualitative research methodology was applied for the interpretation and classification of the initial data. A focus group was formed to develop a uniform coding scheme for all future data collected from the call reports by the outreach librarians. The participants in this focus group included the two authors, and the three unit managers within the ISD. The three unit managers manage different aspects of service development and delivery, which includes the supervision of ten outreach librarians who directly interview the academic members of the university, (customers). Therefore, deep understanding of the CKT by the unit managers is vital for training the outreach librarians and therefore, to ensure the success of this project. During a two-hour focus group meeting one of the authors played the role of coordinator and the other author played the role of knowledge management expert. The former provided qualitative input to the discussions in order to clarify the points made, and/or to steer the focus of the group to the right direction. Data from each call report was read loudly by the coordinator one sentence at a time. After reading each sentence, and based on the formal definitions of the six categories of customer knowledge, the unit managers were asked to provide independent feedback in the form of (i) identifying relevant customer knowledge chunk/s within the sentence that fit the scope and purpose of the study, and (ii) if such relevant knowledge chunks are identified, to comment on the exact category it relates to. After reading each sentence, the feedback was collected by the coordinator and examined. If all three feedbacks were the same then no action was taken and the next sentence was read. However, if there were discrepancies and disagreements among the three responses the matter was discussed until a consensus was reached among all three unit managers. The ‘knowledge management expert’ was responsible for handling the latter situation and directing the group towards a consensus. The process continued until all sentences in the call report were read, and various knowledge categories identified. At the last stage, the call report was coded (see the next stage) for future training of the outreach librarians who themselves will have to go through a similar coding activity after each future interview. Coding Procedure: During the above coding exercise, the group was engaged in constant comparative methods suggested by Glaser (1965). Chunks of text were compared in order to discover similarities and differences among them. According to Lucas and Kline (2008), this process will highlight the different properties for each knowledge category, and “fills” the category out. Even though the three categories were already decided, they themselves were also constantly compared and contrasted so that those with interrelated themes could be merged under one descriptive overarching category. This process is referred by Strauss and Corbin (1998) as ‘selective coding’, which is an integrative process of establishing overarching themes by selecting the “core categories”, relating these to other categories, and verifying those relationships. In order to establish credibility and trustworthiness of the research findings the use of member checking (Lincoln & Guba, 1985) was employed. This method requires the interpretations and conclusions be given back to the participants and allowing them to react to those initial findings. Planned Evaluation of the CKT: As mentioned earlier, the results of the above categorization exercise need to be evaluated for consistency of conceptualization that is extensible and easily reusable in similar environments. This paper proposes the following evaluation methodology as a future work for the evaluation of the proposed CKT. The evaluation will focus on its capacity to incorporate new meanings, relations, domains, and knowledge over time as reused in the case study library, or other related libraries in different institutions. Ideally, this would require longitudinal methods which at the same time will be impractical for the short-term life-cycle of the current research project. Therefore, a cross-section of existing academic libraries will be selected and used for evaluation of the proposed CKT. Views will be sought from the domain expert librarians in this crosssection sample of libraries for ‘correctness’ of the categorized results. Such correctness is defined by both ‘truthfulness’ of selecting knowledge chunks and filling each category, as well as ‘consistency’ of such selection by various coders (Olive 2007). 6. 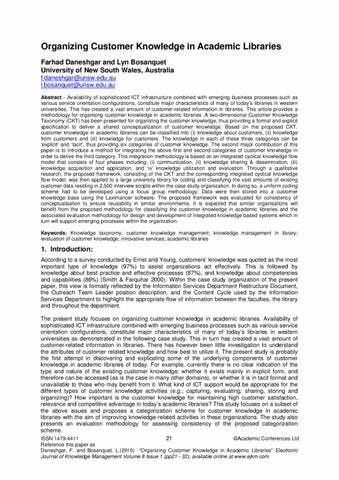 Conclusion and future work This paper proposed a conceptual methodology for organizing customer knowledge in today’s academic libraries called Customer Knowledge Taxonomy (CKT). It was then applied to a sample of data collected from a case study which resulted in a knowledge store for customers’ knowledge for the case organization. The main promise of the CKT is that it facilitates creation of new tacit knowledge that is necessary for understanding customers’ information needs and interests. This understanding, which is called ‘knowledge acquisition and application’, helps, among other things, the creation of innovative ideas for the library. These new ideas can then be used for designing new services for the customers, which are related to the third category of customer knowledge, that is, ‘knowledge for customer’. A plan for future evaluation of the CKT was also briefly outlined. 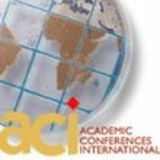 The study has highlighted the enormous amount of tacit knowledge that librarians possess ‘from’, ‘about’ and ‘for’ customers that can now be organized and systematically accessed. Prior to this study no explicit mechanism existed for linking what the librarians know, to how this may support their customers, and more importantly how what each individual librarian knows can be systematically converted into corporate knowledge. Finally the study revealed new capabilities that are required from librarians in today’s academic libraries. A future study is planned to investigate standard ways of anticipating knowledge for customers based on the existing knowledge about and knowledge from customers. Can such a knowledge derivation process be automated? How can ICT facilitate or support the current resource-intensive face-to-face interviews? As a first step, and using the theoretical findings of the present study, work is already in progress for design and development of an ontology-based knowledge management system that supports initial phases of the decision-making processes of knowledge workers in the case study library. Acknowledgement This project was partially sponsored by the John Metcalf Memorial Fund provided to the researchers at the Australian School of Business, University of New South Wales, Australia. References Daneshgr, F., & Parirokh, M. (2007) ‘A Knowledge base Schema for Organizational Learning in Academic Libraries’, Journal of Knowledge Management Research and Practice, Palgrave Macmillan. Issue 5, pp.2233. Parirokh, M. & Daneshgar, F. (2008) ‘Identifying knowledge-sharing requirements in academic libraries’, Library Review, Emerald Publishing, v.57, n.2, pp.107-122 Smith, R. G. and Farquhar, A. (2000) ‘The road ahead for the knowledge management: an AI perspective’, American Association for Artificial Intelligence, Winter, 17-40. Ding, Y. and Foo, S. (2002) ‘Ontology research and development. Part 1 – a review of ontology generation’, Journal of Information Science, 28(2), pp.123-136. Jashapara, A. (2004) Knowledge Management: An Integrated Approach, Pearson Education, Edinburgh Gate, UK, pp.93-100. Olive, Antoni (2007) Conceptual Modeling of Information Systems, Springer-Verlag Berlin Heidelberg. Gummesson, E. (2000) Qualitative methods in management research, 2nd ed., Sage Publications India. Gebert, H., Geib, M., Kolbe, L., and Brenner, W. (2003) ‘Knowledge-enabled customer relationship management: integrating customer relationship management and knowledge management concepts’, Journal of Knowledge Management, Vol. 7, No. 5, pp.107-123. Olive, A. (2007) Conceptual Modeling of Information Systems, Springer-Verlag Berlin Heidelberg, pp.28-30. Glaser, B. G. (1965), ‘Progress in small group research’, Annual Review of Psychology, Vol. 41, pp.585-634. Colleen, L. and Kline, T. (2008), Understanding the influence of organizational culture and group dynamic or organizational change and learning’, The Learning Organization, Vol. 15, No. 3, pp.277-288. Strauss, A. and Corbin, J. (1998), Basics of Qualitative Research: Grounded Theory Procedures and Techniques, Saga, London. Lincoln, Y. S. and Guba, E. (1985), Naturalistic Inquiry, Saga Publications, Beverly Hills, CA. Garside, R., and Smith, N. (1997) A hybrid grammatical tagger: CLAWS4, in Garside, R., Leech, G., and McEnery, A. (eds.) Corpus Annotation: Linguistic Information from Computer Text Corpora. Longman, London, pp. 102-121. Wilks, Y., Slator, B., Guthrie, L. (1996) Electric Words: dictionaries, computers and meanings. Cambridge, MA: MIT Press.